I’ve wanted to make one of these since the first time I saw one. And then several years passed, and finally there are loads of tutorials on youtube. Boy, is this a simple bag. Wouldn’t you guess I forgot when the time came? I didn’t clip the round corners, either. It looks awkward in this flat version, but isn’t noticeable when in use. I forgot to take a photo, but the lining fabric is that the same as that one with little red and pink flowers. It’s a line called “Forget-Me-Not” by Riley Blake. It has a pretty, folklore feel, and I really like it. 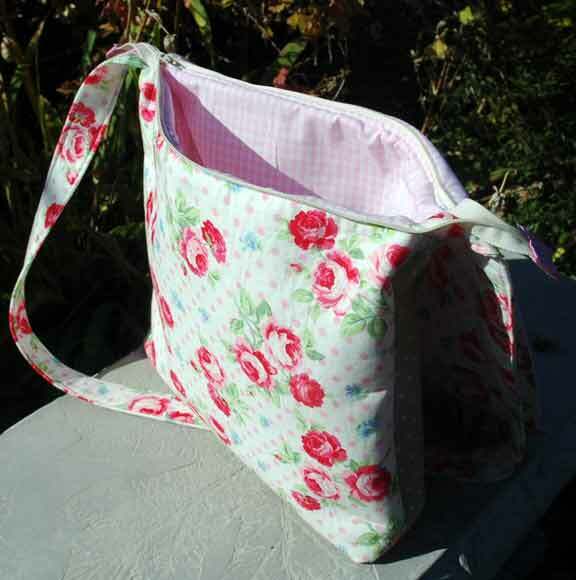 This will be my new project bag, so I can carry around my little sewing box and some embroidery thread and maybe get to work on more tiny necklaces during spare moments (like I have any! spare moments, that is). 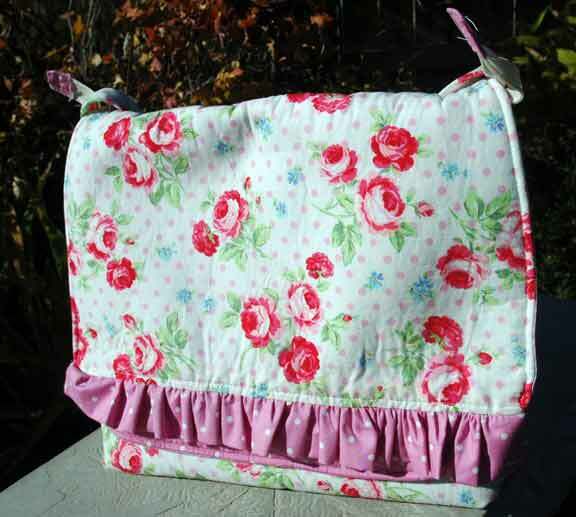 I’m already picking out more fabric, because this would make a great lunch bag, too…. I love this rose and dots fabric, it’s made by Lecien but the selvedge edge (I bought a half yard) doesn’t include the pattern name. The design is so bright and romantically shabby chic. I put in another zipper! I made the tab ends longer this time, thinking I’d be able to machine sew the whole thing if I could open up the zipper and make more room, but I still ended up hand-sewing under the tab ends. There’s a trick to this that I haven’t figured out. I love this design, even if it is a little more trouble! 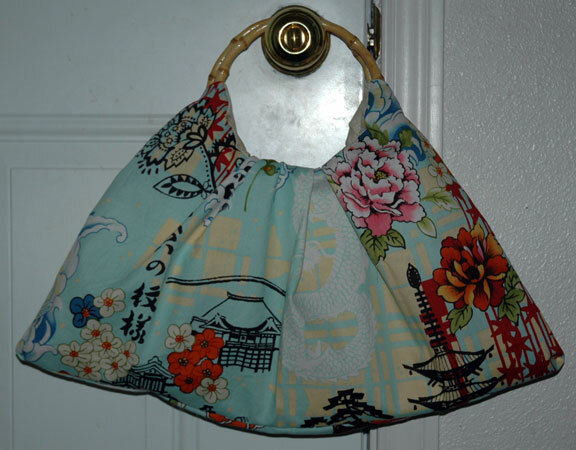 I saw an etsy seller selling these Japanese-style “grandma bag” is what she called them. I thought, “Ah, I have some bamboo handles,” (from a purse that didn’t work out so well) “and the perfect fabric for that!” My sister gave me another stack of fabric fat quarters this summer, so lots of divers fabric for me to put to good use! Isn’t the fabric pretty? The print design is large, so not really a good quilt fabric. But perfect for a purse. I had to figure out how to make the pattern for myself. I did not make up a tutorial because I didn’t know if the design concept was sound, but it worked great! Under an hour to put together, and almost no hand-sewing except for two tacks at either side beneath the handles. Finding a fabric that is just perfect for a design is sometimes tough, and this print is just right for bamboo handles. The part that looks like a design detail at the top is really just the lining fabric peeking high. I think it works just like that though. Yay, something worked start-to-finish just like I imagined it would. (**Not a bag for beginners, you better have a few purses under your belt or you might be disappointed). Come on, summer! I made the Phoebe purse maybe a year ago and was happy with the results but found it a nightmare to maneuver my over-stiff innerfacing through my sewing machine. With this in mind, I lightly innerfaced my fabric this time. Enough to give the purse some body and structure, but not enough to be extremely stiff. The purse sewed much more easily this time, with a lot less headache. I have a friend whose birthday I missed, so I thought since I wanted a purse for myself, anyway, I’d sew up two and let her have the one she liked better. You can see on my above Phoebe I made a rookie mistake of putting the snap closure not exactly in the center. Gah. For the next purse, I used the Phoebe as a basis for the round shape, but added fabric to make the pleat. I am very pleased about the pleat, as it came to me as I was falling asleep, as most good ideas do. My rookie mistake for this one was in completely forgetting to add the snap closure. I can open it up and add one if my friend wants one, though. For me, I’m not so picky. My friend doesn’t have a computer (!) so no worries she’ll see this post. I originally bought the fabric to make us summer napkins, but then decided the red flowers did not really go with my sedate tablecloth collection. And I needed a summer purse, anyway, so this turned out great. The fabric is from Michael Miller. 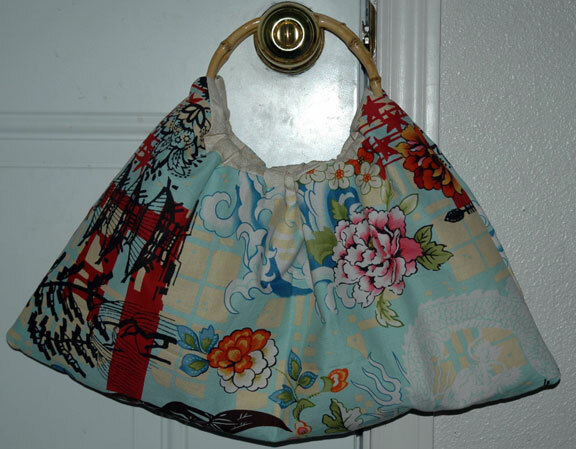 Oh yes, the Phoebe purse pattern is a free download at sewmamasew. You’ll have to do your own search for it. I usually do not like to make the same thing twice, because where is the fun in that? But I have followed rabbit fabric for a long time, and the amount of sophisticated patterns is close to 1%. There’s plenty of cutesy, Easter bunnies with eggs, traditional-Japanese, and just ugly busy patterns. Sophisticated is very hard to find, and I try hard. So after searching and searching for new fabric to use and coming up with zilch, I thought I’d better buy more of the “Hushabye” pattern before it was gone gone gone. I made a small tote/large handbag with a zippered top. I totally understand people want zippered tops so all your stuff doesn’t fall out in the car. I will list it in my etsy shop this week. I also made a great winter or autumn feeling bag, it’s 18-inches wide and about fifteen inches deep. EXCEPT I made a mistake on the lining fabric. Sigh. The sun had been going down as I worked, and I didn’t get up to flip on the light because the sewing machine has it’s own little light. So I made the lining with the reverse side of the fabric showing on one of the sides. In person it’s not real easy to tell even in full light, but still, I’m going to offer it at a discount. I’ve been doing more sewing (as you’ll notice if you have been following my blog) and fell in love with this rabbit fabric. It’s called Hushabye, I don’t remember the artist but it’s for Moda. You can find more of it on ebay just by searching “fabric” and “hushabye.” The rabbits are colored aqua, so it’s not that the photo is dark, they really are a light blue. I made this very big tote, it’s 22″ wide by 18″ or so. I made a matching makeup bag, but rats, did not take a small photo for this post. I am going to list both of them in my etsy shop today, though!